We've often heard of teachers, volunteers and carers being told to ask parents for permission, or even requiring parents to drive over and put the plaster on themselves. This persistent myth causes a lot of unnecessary hassle and worry. There is no rule that says a responsible adult can't put a plaster on a child's minor cut. 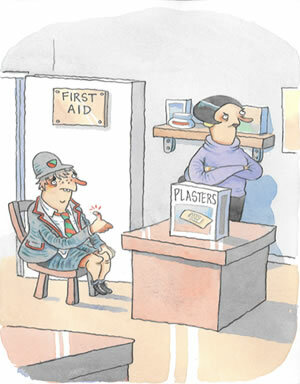 Some children do have an allergy to normal plasters. If you know a child is allergic you can use the Hypo-allergenic type of plaster. The important thing is to clean and cover the cut to stop it getting infected.